We still live in Burnaby, BC and have lived in the same house for 34 years. Bob had open heart surgery twice, 1988 and 1997, but is still busy remodelling, fixing and building houses. He does volunteer work and helps out at the Senior's Centre as a director. Jean knits, keeping family and friends in slippers, children in sweaters and does quilt­ ing. Both of us enjoy watching the grandsons play hockey. We have done some travelling, going to Hawaii, Arizona, Texas and Florida, and took a cruise to the Caribbean. Of course, we take a yearly trip to Erickson. Brian and his wife, Dianne (nee Canning), live in Calgary, AB. They celebrated their 25th Wedding Anniversary on August 25, 1998. Since their move to Calgary in 1978 from Victoria, BC, Brian has been employed by Canem Systems Ltd. and is the chief Electrical Estimator. Dianne is a Science Lab Technician for the Calgary Board of Education. They have four children. Kurt married Brandy Broeffle on May 1, 1999. They live in Calgary. Kwl has his own concrete form work company, while Brandy works for Safeway. 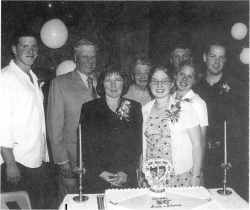 Brent married Natasha Doerksen on August 15, 1999. They live in Calgary. Brent is a graduate of Engineering, Design and Drafting from S.A.I.T. and is currently working for Reid Crowther Partners. Natasha is continuing ber education III Kinesiology at the University of Calgary. Mark attends Mount Royal College in the Pre-Dentistry Program. During tbe summer he operates his own Landscaping Company. Laura is fifteen and attends grade 10 at the Cochrane High School. She enjoys playing on a community basketball team and taking voice lessons. Kenneth is a welder fabricator. He is divorced and lives in Langley, Be. He has three children. Jennifer was born in 1982 and is attending college to be a teacher. Jason was born in 1984 and is in Grade 1l. He works part-time at the Otter Co-op. Joshua was born in 1988 and is in Grade 6. He raises homing pigeons. Ronald and his wife, Brenda, live in Langley, Be. Ron works for Sand R Sawmills, operating a bull edger. Brenda is a Fragrance Specialist at The Bay. They have two chil­ dren. Travis De Fries is a deputy Sheriff in tbe State of Washington, USA. He married Kirsten King on September 18, 1999. Tyler De Fries works as a drywaller III Bellingham, USA. Donna and her husband, Craig McIntosh, live in Coquitlam, Be. Donna works as a playground supervisor. Craig drives and operates a concrete pumper truck. They have three children. Kimberly was born in 1984 and is in grade 1l. Blaine was born in 1986 and plays hockey. Riley was born in 1990 and plays hockey. We enjoyed showing the grandchildren Erickson during the Shell born Reunion in 1997. Many of them had never visited Erickson, so it was an opportunity to show them our 'roots'. Most of them are city kids and this visit gave us a chance to tell many stories about life growing up around Erickson. Wade was born on February 26, 1953, to Elvera and Emil Shellborn. He attended school at Westmount and Erickson Collegiate. He was confirmed in the Lutheran Church. Wade has been farming with his father since he completed grade twelve in 1971. In July 1991 they sold the dairy cows but continued to grain farm. Shortly after, he bought horses to tame and break. In 1998 Wade decided to get back into cattle, this time beef cattle rather than dairy. Wade owns three semi trucks and has been truck­ ing for RTM Transport in Strathclair since 1994. Janice Lynn was born on January 8, 1957 to Sadie and Basil Woloshen. She attended school at Scandinavia School until it closed. She completed her schooling at Erickson, graduating in 1975. On September 25, 1976 she married Wade Olov Shell born. Janice has been a dedicated homemaker since the birth of her children. In 1993 she began to volunteer at the Erickson Collegiate office. She began to work on a casual basis shortly after, and also spent time at the school and town library. In November of 1998 she was hired by the Erickson Credit Union to work on a casual basis.